It had been close to ten years since I last visited the little village of Castelmezzano, where friend and great chef Antonietta Santoro runs her renown restaurant: Il becco della civetta, The Owl’s Beak. Nestled in the rockiest part of the village, the restaurant has expanded from a four-table trattoria to 15 tables with an adjacent inn for those who want to stay the night in charming Castelmezzano. 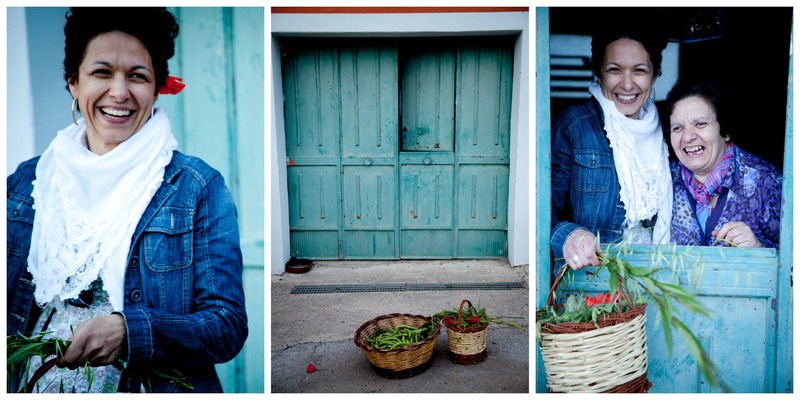 One of a few female chefs of the Basilicata region, Antonietta challenged her preconceived future as a woman immersed within traditional gender values. More than 20 years ago, she abandoned her studies in law to pursue her dream to a have culinary secrets and memories, which were passed down by her aunts and grandmother, eternalized in her very own restaurant. Today her perseverance and hard work have led Antonietta not only to manage one of the most successful restaurants of the region, but to initiate culinary tourism activities as well. 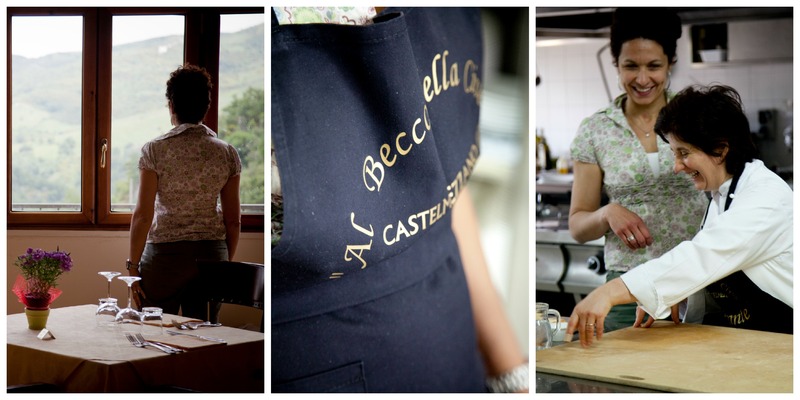 This “tourismo culinario” in Castelmezzano is part of an overall endeavor to attract more tourists in Basilicata interested in a non-traditional vacation option. And it is working; people are taking the unconventional route of travelling and eating, steering away from the beaten track of touristic activities. 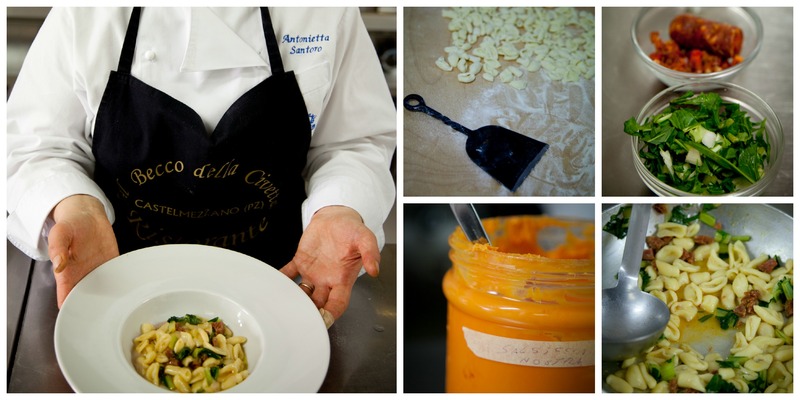 Before Antonietta and I were to start cooking, she had already prepared something for my team. She worried about what we were going to eat and had decided to make three types of breads and pizzas that she had just taken out of the wood oven in the early morning before my team and I were scheduled to arrive. She allowed me to slice the breads, but quickly realized that I didn’t know the proper way to cut it so she instinctively took over and murmured: “it will be quicker this way”. And we ate no questions asked. Antonietta looked nonchalantly in the cupboards of her huge kitchen for inspiration, took a breath and said: I’ll prepare the specialty of the house “cavatelli con crema di fagioli, ciccoria e salssiccia” cavatelli with white bean cream, wild chicory and sausage. In virtually 30 minutes the plate was ready to be eaten. Keep in mind, nothing was pre-cooked or prepared in advance. Not even the homemade and hand-carved cavatelli pasta. Although we had eaten before, none of us could help but fill ourselves again with this unique pasta dish. We left Castelmezzano our stomachs satisfied with goodness and love heading toward Pietragalla, to meet my friend’s mother. Donata is a cheerful, simple and refreshing woman clearly proud of her heritage and so willing to share her collection of customized recipes that have made her famous among family and friends. Before we started cooking, Donata and I set out to a nearby field to pick all the ingredients directly grown from the land. She takes me through the fields to help me pick as well as understand, that what North Americans consider unwanted weeds are in fact edible, wildly used and carry medicinal properties, not to mention taste unbelievably good. 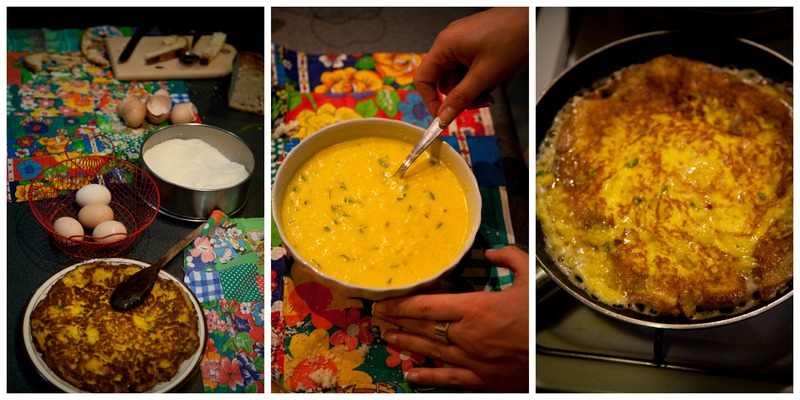 Donata prepared a simple peasant dish common in Basilicata using basic ingredients that the land naturally yields. “minestra maritata”, wild vegetable soup, “ciccoria e fave” chicory and fava beans, and “frittata a modo mio” an Italian omelet her-way.